A plane perpendicular to the axis of an optical system and passing through the focal point of the system. The plane occupied by the film at the focal point of the lens. It can be positive or negative; it is commonly referred to as positive and negative planes, respectively. Therefore, the imaging CCD detector is located in the best position of the focal plane. Innovative low dimensional materials are currently being investigated that exhibit enhanced TE properties while newly developed integration techniques are also being explored to incorporate thermoelectric materials with IR focal plane array manufacturing processes. 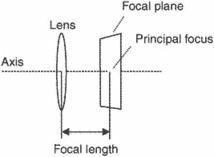 Increasing the film's rotational speed moves the focal plane further from the center of rotation and widens the plane. We also recorded images after adjusting the focal plane to include the centrosome in the center of the aster (images not shown). Using a second computer procedure, the microscope scans many focal planes and builds a three-dimensional image of the object, much as CAT scans do. Tender issueThe objectives of this activity are to produce a structural Development Model (DM) of the Focal Plane Module (FPM) structure for the ATHENA Spacecraft. Now then, what is a Front Focal Plane reticle and why is it important? The rear focal plane reticle does not have the latter problem, but you can become confused and miss a target because the hashmarks change with different power settings. The optics include positive 1/4 MOA windage and elevation clicks on low-profile knobs with reset-to-zero function, side-wheel focus, fast-focus eyepiece adjustment and multicoated lenses with the reticle in the first focal plane. CMC Electronics has been busy developing its Wide Aspect (1K x 1K) Infrared Focal Plane Array (IRFPA) sensor module with an eye to providing commanders greater control of the battlespace with precision targeting at an extended engagement range. The detection portion of the system is centered on a focal plane array of uncooled, millimeter-wave bolometers. Today's newest IR cameras offer a dramatic improvement over existing IR systems because they feature focal plane array technology.